catslave1 sez: That’s Pipi standing up at the front, Blossom at the back and Izzy in the litter tray…. Izzy went to a nice forever home and the girls stayed here.. Pipi still stands up like that all the time. Ob corse , Bunneh. Keep prakktissing yore deportment so yoo can carry teh chokklit eggs carefully. Awww, skweeee lil Pipi! 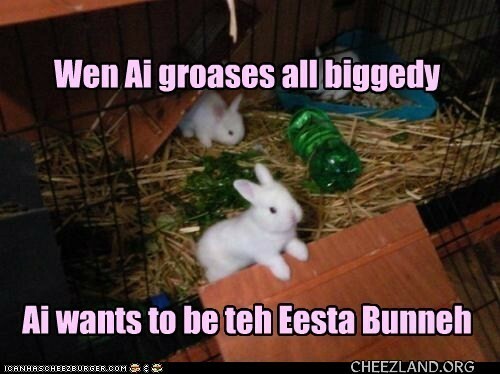 U wil bee teh bestist eester bunneh eber! Happy Bunny tails and Eastery stuffes to eberybody or what someever you celeybrate. *grabs snorgl fing, dukky taype n dark glasses* Dat iz soo skwee!! Wat adoribal bunneez!! OMG!!! ai just was goeing bak in thyme tew luk at teh OBNP kitten grup an ai saw tihs fore teh furst thyme. omg hao cute are tehy!!!!!! !